Blood pressure is the measure of the force of your blood against the walls of your blood vessels. Several essential minerals including sodium, calcium, potassium and magnesium function as electrolytes, defined as minerals that help balance the amount of water in your body. Electrolytes play an important role in maintaining blood pressure. For this reason doctors recommend patients suffering from high blood pressure consume the daily recommended intake of both potassium and magnesium. The National Institutes of Medicine Food and Nutrition Board provides a list of essential nutrients that details the daily recommended intake for each one. They suggest that each adult consume 4,700 milligrams of potassium per day. The recommended intake for magnesium varies based on gender and age. Men ages 19 to 30 should consume 400 milligrams of magnesium per day while those 31 or older should consume 420 milligrams per day. Women 19 to 30 should consume 310 milligrams of magnesium per day while those 31 or older consume 320 milligrams per day. Potassium performs many important functions in the body. In addition to balancing fluids in the body, it is vital to normal heart function and aids in muscle contractions. The effect of sodium, or salt, on blood pressure is well known. What many people fail to realize is that potassium and salt work closely together in the body and that a deficiency in potassium can contribute to high blood pressure, according to the American Heart Association. Potassium works to counteract the effects of sodium. Therefore as potassium levels decrease, the sodium affects blood pressure even more. Approximately 50 percent of all the magnesium in your body can be found in your bones, according to the National Institutes of Health Office of Dietary Supplements. In addition to contributing to strong bones, magnesium also maintains normal muscle and nerve function, keeps the heart beating regularly, supports a healthy immune system and regulates blood sugar levels. Magnesium also works with the other minerals in the body, such as sodium and potassium, to regulate blood pressure. The University of Maryland Medical Center indicates that increasing your intake of magnesium through healthy food choices decreases your risk of developing high blood pressure. Because many of the foods rich in magnesium, such as whole grains, spinach, bananas and potatoes, also serve as good sources of potassium, doctors and scientists find it difficult to specify the role of magnesium in blood pressure. 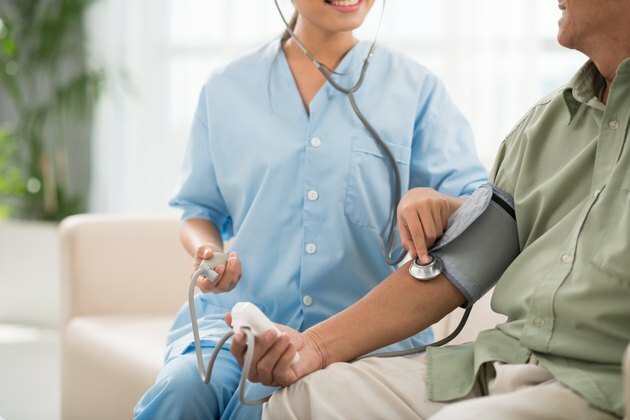 Controlling your high blood pressure defined by the National Heart Lung and Blood Institutes as consistent measurements of 140 mmHg over 90 mmHg or higher, requires making lifestyle changes. Because minerals such as potassium and magnesium affect your blood pressure, the foods you choose to eat become important. The National Heart Lung and Blood Institute developed an eating plan known as the Dietary Approaches to Stop Hypertension, or DASH for short, that has proven to lower blood pressure. This diet emphasizes following a low-fat low-sodium diet that includes fruits, vegetables and low-fat dairy products in order to get plenty of calcium, potassium and magnesium.